Omega-3 fatty acids provide a promising complementary approach to traditional methods of treating attention-deficit/hyperactivity disorder, according to a 2006 review published by A.J. Richardson in the International Review of Psychiatry. Omega-3 fatty acids should not replace standard treatments for ADHD, states a 2006 review published by Marlene P. Freeman and colleagues in the Journal of Clinical Psychiatry. If they are used as an adjunct treatment, you should consult a health care provider for advice about the correct dosage to give your child. Omega-3 fatty acids are concentrated in the human brain and appear to be important for cognitive function, according to the University of Maryland Medical Center. Omega-3 fatty acids include docosahexaenoic acid, or DHA, eicosapentaenoic acid, or EPA, and alpha-linolenic acid, or ALA. DHA and EPA can be found in fish and fish oil supplements, while ALA can be found in vegetable oils and some nuts. DHA is important to brain functioning, nerve health and visual abilities. Increased intake of EPA reduces the risk of coronary heart disease, high blood pressure and inflammatory disorders, such as rheumatoid arthritis. ALA can be converted into EPA and DHA in the body. Children with ADHD often have lower levels of omega-3 fatty acids, according to the 2006 review published by Marlene P. Freeman. Dietary supplementation of DHA and EPA through fish oils may help alleviate some symptoms of ADHD in some children, according to the 2006 Richardson review. Larger studies are needed to confirm this finding, as well as to determine a recommended dosage. In one study performed by A.J. Richardson and B.K. Puri, the children received 480mg of DHA, 186mg of EPA, 864mg of of cis-linoleic acid, 96mg of GLA, 43mg of AA and 60 IU of vitamin E daily over a 12-week period. Cis-linoleic acid, GLA, or gamma-linolenic acid, and AA, or arachidonic acid, are omega-6 fatty acids. Reductions in ADHD behaviors were noted in these children. In a study published in the American Journal of Clinical Nutrition in January 2000, researchers noted improvements in parent-child interactions and positive reviews in teacher-rated attention. Participants were given 480mg of DHA, 80mg of EPA, 40mg of AA, 96mg of GLA and 24mg of alpha-tocopherol acetate, or vitamin E, for four months. 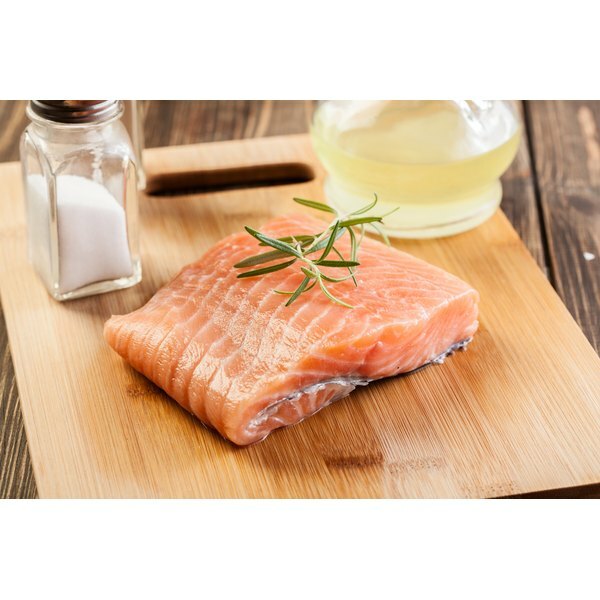 It's important to have a balance of omega-3 fatty acids, found in fatty fish and nut oils, and omega-6 fatty acids, which typically provide fat in an American diet. Most omega-6 fatty acids are found in vegetable oils. They are also found in nuts and seeds. According to Paul Montgomery, D.Phil., a researcher in the psychiatry department at the University of Oxford in England interviewed by Additude Magazine, the right ratio of omega-3 fatty acids to omega-6 fatty acids seems to be about four to one. Make sure your child gets omega-3 fatty acids from fish. Harvard School of Public Health recommends that young children should eat two servings per week of fish or other seafood; however, avoid fish with high concentrations of mercury, including shark, swordfish, tilefish and king mackerel. Fish oil capsules should not be used in children unless a health care professional has directed otherwise, according to MayoClinic.com.